just west of 7563 Lake Rd. 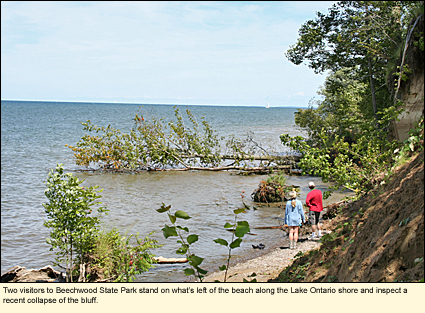 Beechwood is 315 acres of undeveloped, unmarked land with 3,500 ft./1,067 m. of shoreline along Lake Ontario. 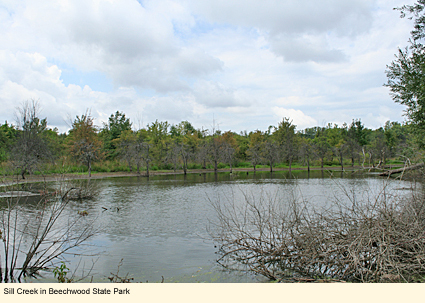 Until 1999, 150 acres of the land was a Girl Scout camp. called Beechwood. The buildings are still standing, some more than others. Explore them at your own risk. After acquiring the Girl Scout camp, the state acquired an adjoining 165-acre fruit orchard to the west of the camp through which runs Sill Creek. The orchard is overgrown, but paths through it are being mowed. The entire park is a good place to test out a GPS. There are no docks or formal launch areas. There are no signs (other than at the entrance to the park) or marked trails. There is no beach. There certainly was a beach at one time, the typical Lake Ontario beach with small and large stones (the larger ones being known as cobblestones) underlaid with sand. However, there have recently been a number of landslides, and the beach is now covered with downed trees, sand, and rocks that have fallen from the bluffs. These are dangerous and shouldn't be climbed. 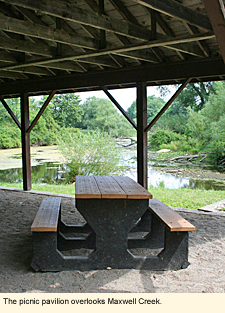 There are two public toilets at the eastern entrance of the park in the picnic area. 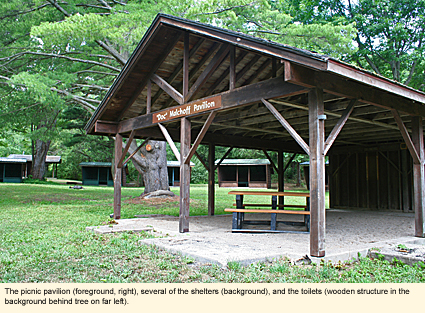 There are a number of small shelters in the picnic area designed for sleeping with sleeping bags. 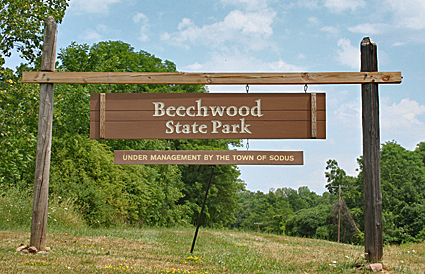 The park is now under the management of the Town of Sodus. For questions about camping, contact the Town Clerk at 315-483-6934. 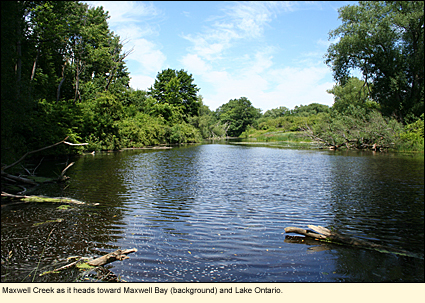 One might be able to launch a canoe or kayak into Maxwell Creek from the picinic area at the eastern entrance just before it enters Maxwell Bay. The Bay exits into Lake Ontario. 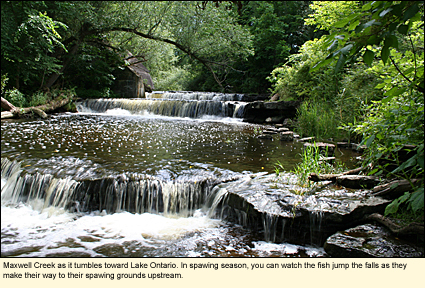 Do not head upstream as you will run into vegetation and, beyond that, a waterfall and private property. There are roughly 2 mi./3.2 km. of mowed trail in the camp area and several miles of mowed trail in the orchard that are excellent for easy walking, snowshoeing, or cross-country skiing. There are many gorgeous very tall and very large trees, especially black cherry, beech, and tamarack. There are also numerous wildflowers, both native and non-native. There is a wide variety of wildlife. Birding is good, and excellent during during migration, especially in the orchard. There is biking along Lake Road that is easy to moderate in difficulty and scenic with many cobblestone homes and orchards in the area. Lake Road is well paved with a paved shoulder. On the east side of Maxwell Creek Inn is a marked driveway leading to the New York State Department of Environmental Conservation's fishing access site for Maxwell Bay. It has a paved parking lot, a short trail, and spots from which to launch kayaks and canoes into the bay. Directly across the road from the inn is a paved parking lot. From the rear of the lot is a narrow dirt trail that runs along (upstream) Maxwell Creek. If you follow this upstream a short ways, you will come to a beautiful waterfall. This land is owned by Wayne County and is open to the public. Map: The only map of the park appears to be one in Take a Hike by Rich and Sue Freeman (see below), and that one is slightly out of date.